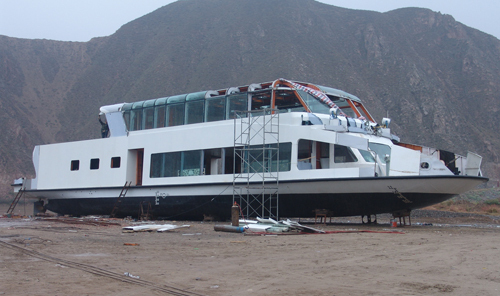 A 17 million yuan (US$2.68 million) luxury cruise sank in the Yellow River immediately after it was launched in Lanzhou in northwest China. 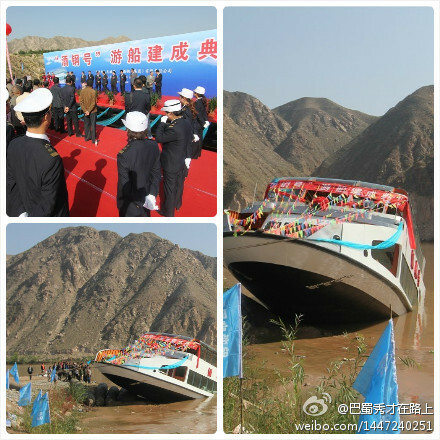 The ship, "Jiugang" went down due to a mishandling error on September 29 and was salvaged three days later. No one was hurt in the accident, the Nanfang Daily reported yesterday. A picture posted on the Internet showed the stern of the ship submerged, with the bow tilted up at an angle of about 30 degrees. The ship was commissioned by the local Jiugang Group. The Lanzhou Transportation Bureau was in charge of its construction. The cruise ship is 32.4 meters long with a top speed of 22 kilometers per hour and can carry 80 passengers. A bureau official, surnamed Qiao, said the ship was built by a Sichuan Province company, but media reports said it was constructed in the city’s Gaolan County.